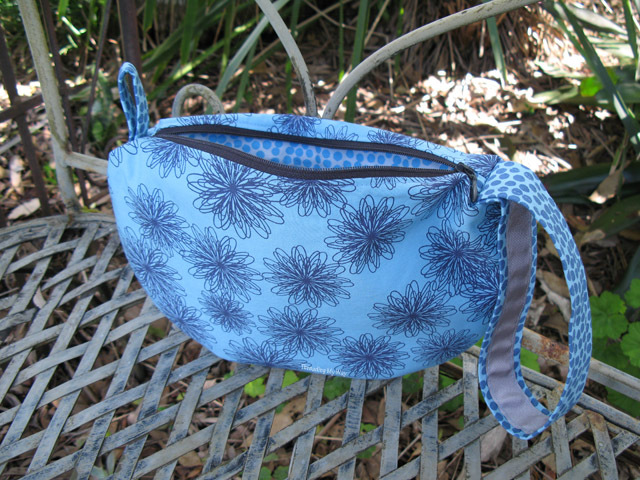 There's a new zippered bag pattern on the market - the Retro Reticule. 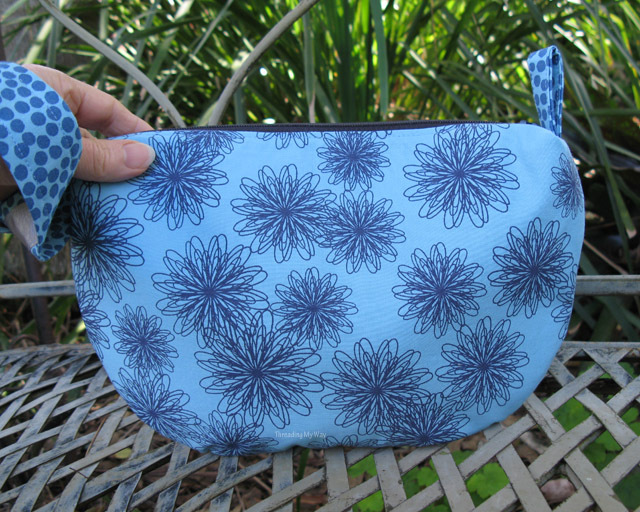 Designed by Rochelle, from eSheep Designs, the Retro Reticule is a zippered pouch with a difference, and in her own words is a salute to a simple vintage purse design from yesteryear, with a couple of updates. I was lucky enough to test the Retro Reticule pattern and thoroughly enjoyed the process. The bag sewed up very easily following the comprehensive and well set out directions. The fabrics I chose all come from the same fabric line ~ Figures, by Zen Chick, for Moda Fabrics. I bought a fat quarter bundle early last year, and it really does make co-ordinating fabrics much easier for me. Although the bag is designed to be carried via the wrist strap when threaded through the loop, there's no reason you couldn't also carry it un-looped, making the bag even more versatile. The PDF includes pattern templates, with complete pattern markings - fold line, grain line, etc. The only pieces to be cut from measurements are the zipper tabs, loop and wrist strap. 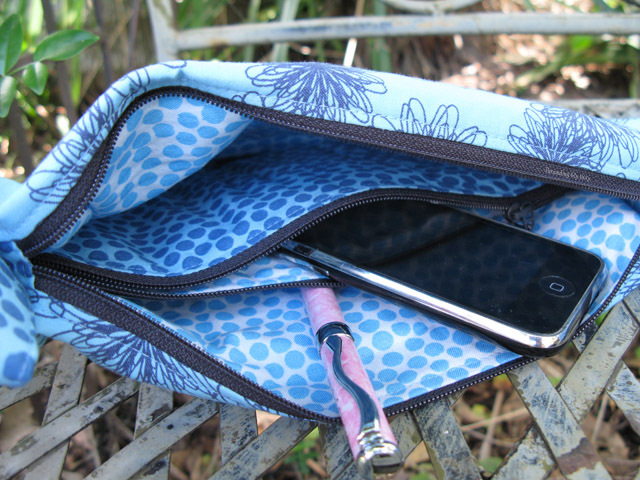 Inside is a handy zippered pocket, making three compartments in all. If you're scared of zips, don't be. They're not as hard as you might think, and Rochelle's instructions are very detailed. The small bag is deceptively roomy, although with the strap looped through, it holds a little less. As an evening bag, there'd be plenty of room for all the essentials. I've made good use of my Retro Reticule, using it several times already, although perhaps not for its intended purpose. 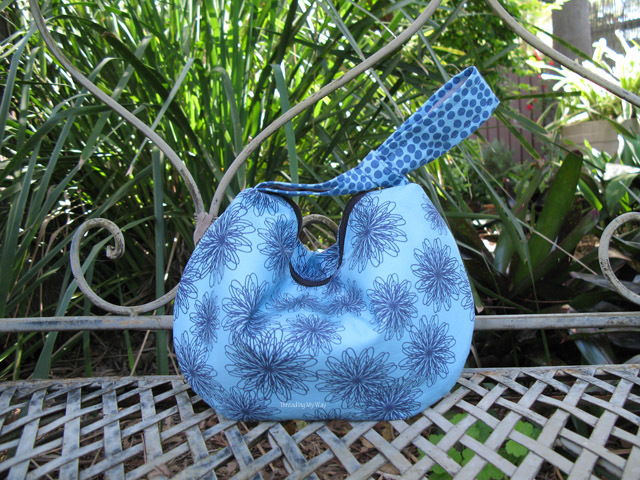 My new bag has become the perfect way to carry my hexie projects when out and about. 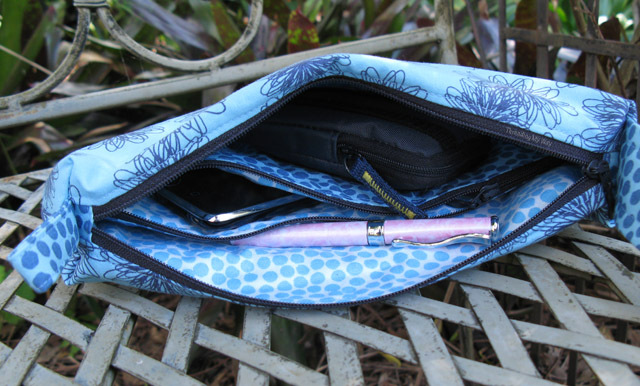 Scissors, needles, wonder clips and thread are contained in the small middle zippered purse and the other bits and pieces fit well into the other two compartments. The whole bag slips easily into my leather handbag. Rochelle, you've designed a fabulous bag and written a great pattern!!! I have plans to make another Retro Reticule, but with a modification to the strap, making it longer and replacing the loop, so the bag becomes a small shoulder bag or cross body bag. But that's for later in the year. I didn't realize this was a zippered bag until reading your review. I thought it was more like the Japanese knot bag. The zipper on this one makes it more secure which is nice. I am thinking of making one in a nice glitzy fabric for dressier occasions. It looks like it will be more comfortable than carrying a clutch. Got the pattern. Thanks! I absolutely love this! I was just telling my husband that the next time we have to dress up for a dinner out, I need a small handbag! This would be perfect. Thanks for reviewing this!! You are such a pro at zippered bags Pam! Oh, and I just bought the pattern now too! That is a cute purse, Pam. I like that it has the zipper! Thanks, Dawn. I love my new bag. Thanks for the testing effort and the kind words about the project, Pam! 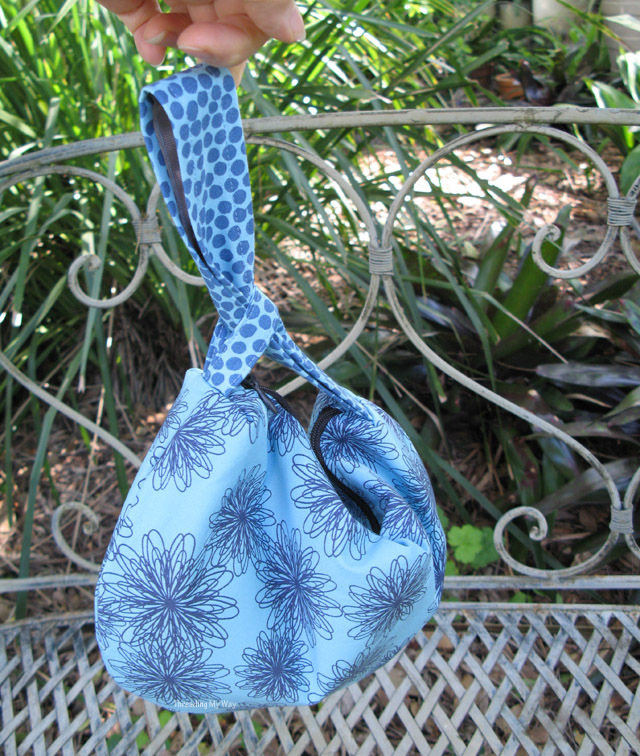 I am grateful that you have such a knack for sewing pouches like this and that you set aside time to tackle this one. Many thanks! What a great design ... and a great bag! I'm all about the "practical" - and this one looks practical AND pretty. Very nice! I love it!! The compartments inside are awesome. Great purse! Interesting design, and I think you are right, it will look great as shoulder bag too! It's lovely, pretty and practical - perfect! I love the look when it's through the loop but the fact it zippers so the contents are more secure seems like a great idea. Lovely bag and design. I love the inside pocket too, they are so handy!! I love the fabric you picked for the purse. Blue is my absolute favorite. And I like that the purse has so many compartments. Hi Pam! Your new bag is very pretty! The inside pockets are great! Love the fabric too! Your bag turned out beautifully, Pam. This is my kind of pattern. Looks relatively easy. 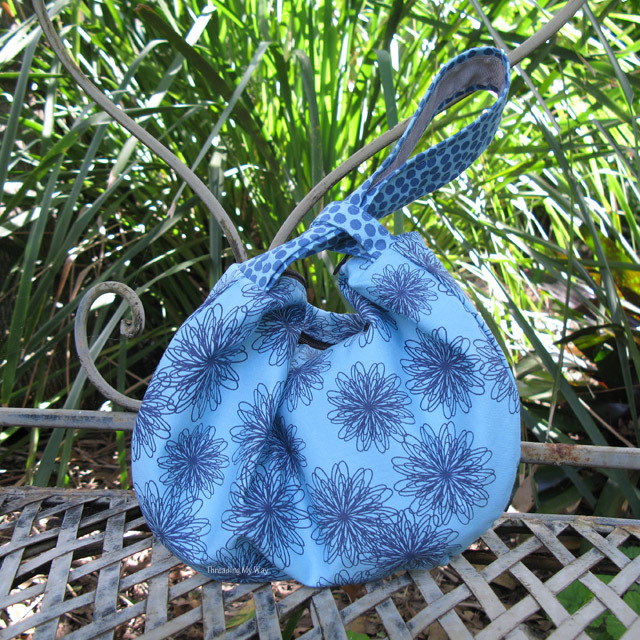 I am not a bag maker and have only made one pouch! You've definitely made such a pretty version with those fabrics. I really like bags with this kind of shape to them, perhaps it's the retro fan in me! And I think it will look great with a shoulder strap, look forward to seeing that version.